I am an artist. My medium is vitreous enamels - glass fired on metal. I use basse-taille, firescale, and precious foil enamel techniques as a means of expression. The vibrant colors and tactile surfaces which can be created are endlessly facinating to me. I love firing glass on metal. I create non-functional vessels, wall pieces and sculptural objects, though jewelry is still part of my artistic vocabulary. I sometimes work from my drawings or 3-D models, but not as much as I did earlier in my career. For me, working intuitively and directly with my materials is the most satisfying way of creating art. I find inspiration in nature, events in the world, and even my own external and internal life. Texture, color, and pattern have always been important elements in my work, probably inspired by my interest in fiber and fabric. I find symbols, rituals, myths, customs, and tradition in various cultures fascinating. I have a need to address serious subjects but I also find a lot to laugh about in life. I like visual puns and jokes. I hope some of my work will cause the viewer to think seriously about certain subjects, but I hope other pieces will elicit a smile. I believe there are certain elements that are common to all cultures, which touch us as human beings despite the boundaries of time or space. I hope that I can synthesize all these influences and inspirations into pieces that speak to peoples hearts and minds. As of May of 2013 I will have a Resident Artist studio at the Sandy Spring Museum. I have taught Enamels at Glen Echo Park and given enameling workshops for several enamel guilds. I was a Resident Artist at Rockville Arts Place for two years. For nine years I was a member of the co-op Enamelists Gallery at the Torpedo Factory Art Center, where my work frequently received juror commendations. Some of the awards I have received were for my work in the Creative Craft Council 2007 Exhibit, Washington Guild of Goldsmiths 2002 Exhibit, Strathmore Members Juried Exhibition, Montgomery County Juried Art Show, and the National Enamelist Guild 1997 Exhibition, juried by Kenneth Trapp. I exhibit widely and participate in Fine Art and Craft Shows on the East Coast. I am a member of The Enamelist Society, National Enamelist Guild, Enamel Guild/North East, Northern California Enamel Guild, Washington Guild of Goldsmiths, and Pyramid Atlantic. True enamels are glass, fused to a metal base - 24K gold, pure silver, copper, or steel - at about 1500 degrees Fahrenheit. Firings are usually brief. The piece is placed into a pre-heated kiln for one to ten minutes. However, depending on the technique being followed, the piece may be fired anywhere from one to over thirty times. Multiple firings can increase both the depth of color and the complexity of the design. 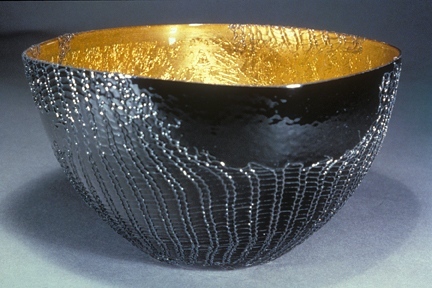 In addition to the classic techniques (basse-taille, cloisonné, champleve, plique-a jour), modern Enamelists create endless variations by borrowing freely from the other arts (photo-silkscreen, electro-forming, and raku) and by constantly experimenting with the enamels and the firing process itself.